No Up Sales, No Gimmicks! What do our customers want to avoid? AN AMAZING THING HAPPENS WHEN YOU TAKE THE TIME TO LISTEN AND PLACE YOURSELF IN SOMEONE ELSE’S SHOES! Take just a second and look at all the benefits that were generated just from listening to the folks in our community. Over the years, we have been able to develop a very efficient scheduling process that helps to ensure that nothing goes wrong with your appointment. Whenever we receive a call, we make sure to confirm all the scheduling information over the phone and then send all the scheduling and pricing information over to the customer’s email just to make sure that all the information we wrote down is correct. This helps to reduce the chance of any miscommunication errors which also helps to ensure that your technician arrives at the right location, at the right time, with the right work description, and at the right price you were promised. Another area that we are very thorough in is making sure you had a pleasurable experience with us. Upon the completion of your service, someone from our office will contact you as a courtesy to make sure the technician did everything you were hoping they would do. This is one of the best ways we have found to keep track of our employees and make sure they are offering you and others a great service on a consistent basis. This is probably the benefit that we are the most proud of. Choosing to compensate a technician for selling someone a new HVAC system really is a disservice to the customer. Service technicians that receive compensation for selling new equipment is a “very” common practice and there are even sales classes that dealers and distribution centers host that are designed to teach technicians how to sell their equipment. Just trying to hire a technician that is willing to work without getting a sales commission is hard to find because most technicians are accustomed to making a little extra and as you might imagine, it’s up to the integrity of the technician to make sure they are honest in their evaluation of your unit. At Total Trans4mation, our technicians don't have a reason to try and “sell” you anything because they are rewarded for their good work and honesty, not their volume of sales. In fact, our technicians would rather repair the unit and prove their quality of work than to try and sell you a new heat and air system because we hire high character people that take pride in their work. Taking the high road on issues like this is essential because it’s the only way to truly protect the customer and keep them from being taken advantage of. If you call us, you can rest assured that our technicians will have no hidden agenda or reason to steer you into buying something that you truly don’t need. The Maintenance Value Plan, otherwise known as the MVP plan, is a preventive maintenance program that rewards members that are currently under contract. With this plan, you receive the best pricing on things like repairs, cleanings, inspections and installations. MVP Members receive the following benefits. 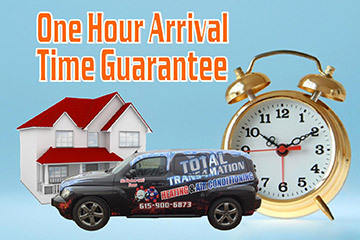 Time is money, and our commitment to respecting your time is backed by our one hour guarantee. If we don't arrive at your home or business within your one hour appointment time frame, you will get the diagnostic charge for free, no questions asked. This is the longest installation warranty that we have found anywhere, and did we mention that it’s 100% free? By offering our customers a complimentary two-year installation warranty on most installations, we are demonstrating just how much we truly believe in our products as well as our quality of work. If we approve of the HVAC design, equipment and scope of work, we will stand behind the installation 100% during the first two-years. 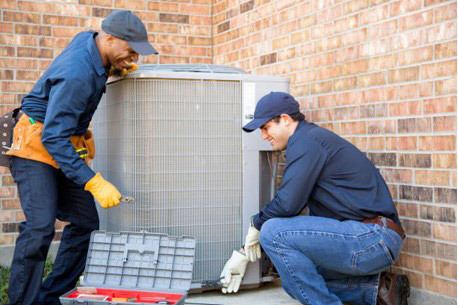 We guarantee to beat any price on all heating and air conditioning products and services if they are of equal value. At Total Trans4mation, you get excellent service, reputable products and superior quality of work all for the lowest price. Who says you can’t have your cake and eat it too? As a servant-minded company, we see customers as people first and dollars second. Our slogan, “more than just a business”, summarizes how we feel about our community because we don't want to just gain customers; we want to make friends for life. Give us a call and find out for yourself the extent to which we will go to earn your friendship.